Last night I made out with a really hot guy. It was exciting, it was great. Suddenly he was cuming on my face- what the hell? It didn’t make sense, our bodies weren’t even oriented in a way that would make such a thing possible and our actions weren’t “advanced” enough to make such a thing possible. hadn’t progressed that far yet anyway. I woke from a dream a stared into the darkness through the mesh film of my tent as light rain sprinkling down on me. Yup. It was a difficult night of sleep. The noise of swarming mosquitos only inches from my face kept me up awhile. I tried to focus on the sound of the waves. When I eventually woke up in the morning, I was shocked to see multiple boats going by, including a tourist cruise ship not far from where I was sleeping! I thought I was being so stealthy by sleeping here but I guess I avoided the rangers but not everyone else. Ooops! I could imagine the passengers on board pointing to my disheveled figure on the shore and snapping pictures of the feral girl. I was tired but I had a spring to my step as I left Pictured Rocks, it’s been a beautiful hike and it has really helped my morale to have other people around me on a regular basis (and the fact that I pass them all doesn’t hurt!). As I left the park and walked into the town of Munising, a man in a passing car called out “congratulations! You made it!” I wanted to correct him, to tell him how much further I still have to go, but I decided to enjoy it instead. Munising is a cute little town with genuine Yooper culture. I ate breakfast at an unassuming little restaurant called the Dogpatch where I had the absolute best waitress I have ever encountered. I told her so and tipped 50%. At the post office, I picked up the long underwear I’d forgotten back in Paradise. I shook my head to think of how much I needed them that cold awful night on the beach but I’m grateful to have them back. I stopped at a coffee shop to write a thank-you note to the woman who shipped them to me and took the chance to write a few postcards too. 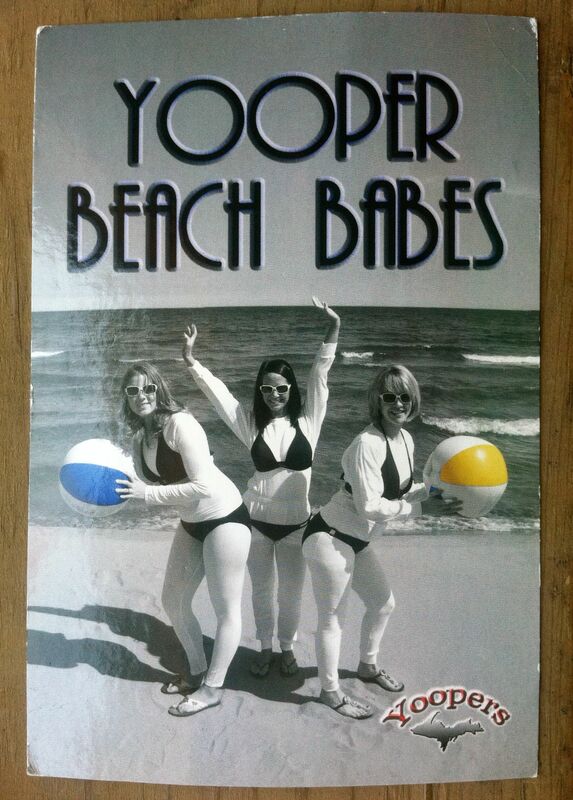 I especially loved the Yooper Beach Babe one after that comment yesterday. Leaving town this afternoon, I am swallowed up in what feels like true wilderness again. I am still dealing with some serious sexual frustration- you think all this walking would take it out of me! Illogically, I find myself following footprints in the ground in hopes of catching up with whoever made them. It’s amazing that it’s already August! I am close to 4 weeks and 400 miles on the trail. Hell yeah. I’m only 2 days away from Marquette. It’ll be nice to rest my poor shin and explore the city. I’m actually ahead of “schedule” in spite of my poor planning and all my mishaps. Then again, I’ve skipped a few patches of the trail by catching rides but I only count the miles I hike and who cares if I don’t do it perfectly? I am answerable only to myself. I know what I did. I am not a trail purist- out here to physically touch every inch of the trail, I am a purpose purist- out here to fulfill a dream without really knowing how it will play out. This entry was posted in Left of East and tagged michigan, Munising, north country trail, Pictured Rocks, Upper Peninsula. Bookmark the permalink.